What a fantastic Christmas holiday we had on this trip. 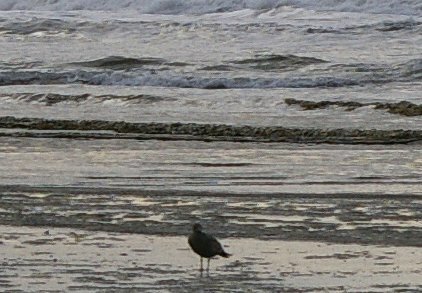 For the last few years we've spent a long December weekend in Ocean Shores with friends. We love the town and so this December our friends were otherwise engaged, so we decided to come down for the week of Christmas, just the two of us. The two hour drive turned into nearly four hours when we decided to stop for lunch at i.talia in Olympia. 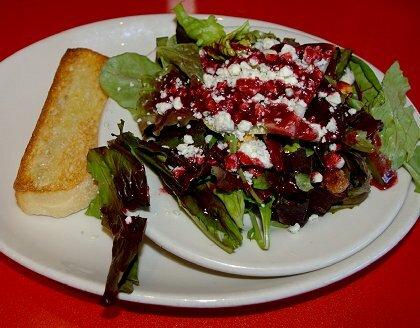 If we had seen the long line of cars at the Black Lake Mall exit before we pulled on to it, we would have skipped the wonderful salad, pizza, and Olympic Mountain Ice Cream. It took nearly forever to get off the freeway, find the restaurant and get back on the freeway. In this case, nearly forever meant an hour and a half, with most of that waiting at lights. Last minute Christmas shopping strikes again. Once we were back on the freeway, the driving was easy. 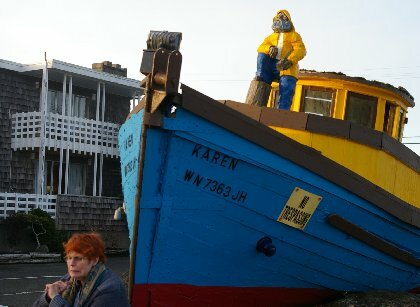 The weather was good and best of all we arrived in Ocean Shores before dark. The daylight drive between Hoquiam and Ocean Shores is a delight. At night it's not . . . and it's even worse in the rain. But this trip the rain stayed mostly on the plain. The day was grayish, but still beautiful. Almost any time of day you can walk or drive to the beach and be mesmerized by the wind and waves. Our hotel room on the fourth floor of the Shilo Inn gave us a great view of sand, golden grass, sturdy shore shrubs, beach, ocean, and sky. What a combination. This was our first time at the Ocean Shores Shilo Inn but it won't be our last. The lobby is both huge and interesting. 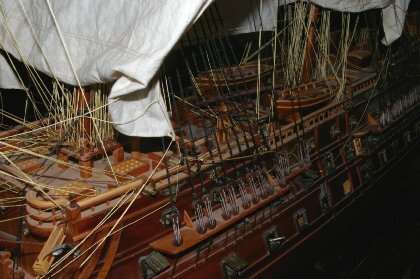 They have a collection of museum quality models of ships (most between 3-4 feet in length). My favorite was the San Felipe (the lead ship of the Spanish Armada) which carried 104 guns. In 1705 it sank carrying several tons of gold after a twenty-four hour battle between 12 Spanish ships and 35 British ships. There was also a model of HMS Victory, which was the flagship of Lord Nelson at the sea battle of Trafalgar in 1805. HMS Endeavor, the smallest model, was the ship that Captain Cook sailed to explore the South Pacific. There were also two models of the USS Constitution, better known as Old Ironsides. The attention to detail on the models was remarkable, although they are beginning to show wear (and dust). The ships are within easy reach of little fingers and open to mischief. Even if you aren't staying at the Shilo, it's worth a trip to the lobby to take a look and enjoy the nautical models. An old friend of ours in Tacoma used to build a miniature Victorian Dickens Christmas tableau every year. He would have loved the large display also laid out in the lobby. There were barriers to keep children away from tiny figures. 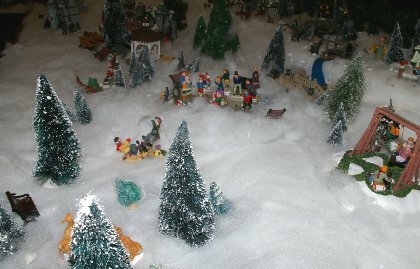 Although the Christmas scene wasn't as large as London, it still took up probably six hundred square feet. As a child I would have laid down tracks and connected the tables and backdrop with my electric train set. Today, a radio-controlled four-wheeler could take a fun romp through the little English town. Once we were checked in and out of the elevator on the fourth floor I peered down the corridor. It looked like a scene from The Shining, the Steven King story of an empty resort hotel in the Rockies. My first thought was, "Whoa, this is a long way to walk." After staying at the hotel for four nights I appreciated the long walk to work off some of the great food we found in the hotel restaurant. We had a "junior suite," which had a living room/bar combination with a door to a balcony. There was a king-size bed in the bedroom area, and a long vanity by the hallway door, plus a complete bath. The only complaint we had was the age of the televisions. 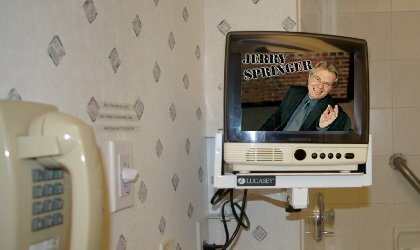 They worked fine and cable was good, but new flat screen LCDs would be an excellent addition there. 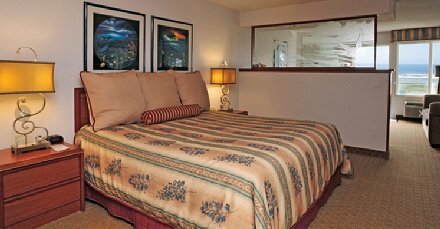 We had great service and we loved the room, so TV was really secondary or thirdary. Actually, I had thirdary on my knee a few years ago and it wasn't that bad. We hadn't planned on dinner for our first night, but it wasn't completely off the table. When we checked in we not only received coupons for free breakfasts, but also drink tickets. We also bought twenty-five dollar dining coupons for only twenty dollars each. 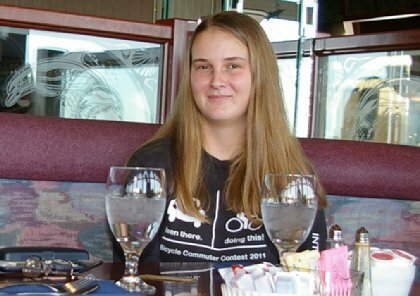 We saw Stephanie, one of the hardest working waitresses I've ever met; she was almost constantly running as she greeted, hugged, and served. 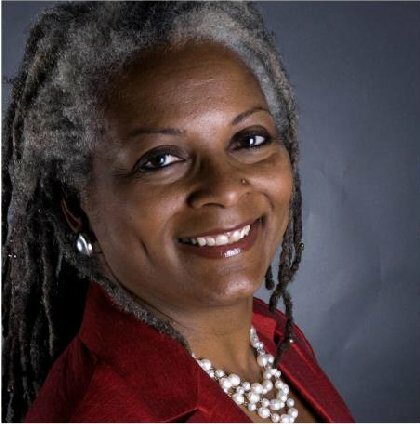 She had Christmas day off, but her daughter was there to take her place. For our unplanned dinner we had crab cakes (excellent) and seared steelhead with perfectly crispy skin. The steelhead was so good I thought perhaps Peggy had cooked it. Although, we planned to have a return engagement with this great combo, there were other dining interests that caught our attention over the next few days. After dinner we returned to our suite to read and relax. I'm an early riser and the next day I visited a comfortable area just off the huge lobby. There were tables, chairs, and couches along with a large screen LCD TV. Although the TV was on, I made notes to myself and planned out several new marketing campaigns for clients in the morning quiet. Just across the hall were the coffee and hot water dispensers. I helped myself to coffee before I finished writing. Then I moved on to the lounge/restaurant for breakfast. I really like the breakfast business model Shilo uses in Ocean Shores. With the breakfast tickets you have a selection of a number of offerings, which range from oatmeal, to biscuits and gravy. You are also able to purchase sides like hashbrowns, bacon, sausage links, etc., for about two dollars each. I found this much better than many well stocked breakfast buffets at other hotels. Massed produced scrambled eggs are not on my preferred breakfast menu. I visited the coffee dispensers on my way back to the room. Peg was still sleeping, so I let her get a few more ZZZs and put her coffee by the microwave. When she woke up she had yogurt, a banana and cereal, which we had brought along with us. The refrigerator worked well for our food items (mostly bottles of Diet Pepsi). We also put Martinelli ciders on the balcony to keep them cold without filling up the racks and door storage in the reefer. We thought we would take in Catching Fire at the Ocean Shores Cinemas. We saw The Hobbit there last year at the midnight showing. Along with the other three other couples in the theater we enjoyed Catching Fire this year. We've read the books, but had missed the first film of the Hunger Games. Catching Fire was the second installment. 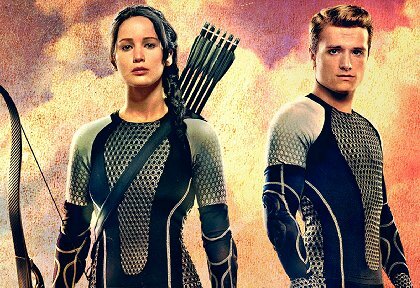 It starred Jennifer Lawrence and Josh Hutcherson. I've enjoyed watching Hutcherson grow up in feature films. My favorite is Little Manhattan. After the movie we went to the local IGA for some groceries and newspapers. The IGA is THE place for buying produce, sandwich meats, and even some deli foods. Actually, I dropped Peg off by the front door and then went to park. 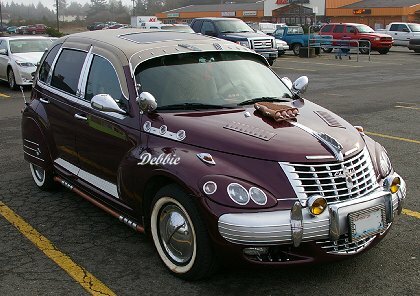 I saw this all tricked out "Chrysler" Cruiser and had to park and walk around it. I have two friends with red Plymouth PT Cruisers, but they are plain Janes compared to this super, classic looking airflow throw-back. I loved the fender skirts. The Cruiser had enough bling on it to crush a rapper. All it's lacking is a "gold grill" (gold teeth). When we visit towns we always look for the local papers to see what entertainment there is going on. We missed all there was to see. It either happened before we arrived or was happening after we left. No worry. We entertained ourselves. Christmas Day was waffle day for us. We slept in a little bit and then visited the Shilo Inn restaurant. 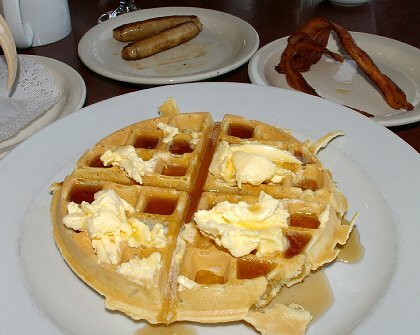 The waffle was excellent with sides of sausage and bacon. Peg had the biscuits and gravy with a plain biscuit. The restaurant makes everything from scratch, so their biscuits were flakey and good with jam as well as gravy. They cooked hashbrowns the way we like and order them as well (burnt, burnt, burnt . . . with an onion cooked in them). The waffle was absolutely perfect. Lots of butter AND hot maple syrup. What's also marvelous is that if you grab a table by the window in the morning early enough you get a great sunrise. If you arrive late you can still enjoy the view of the dunes and the ocean. You can't lose. After breakfast we visited the beach and saw a touching scene. We didn't want to intrude, but could only guess at the significance of the planted flowers on the beach. A loved one lost as sea? Ashes being swept out with the tide? A favorite family picnic? Who knows, but touching. 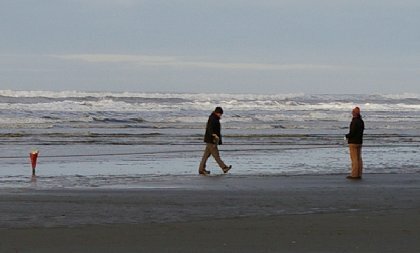 At Ocean Shores you can drive on the beach for miles. You just can't drive where you'll damage sealife or where you'll get stuck. I've seen cars with their wheels digging into the wet sand and cars being dug out of the dry sand. Name your poison. Have fun, but don't be a fool. There are plenty of interesting sights for photo opportunities. Here is an old boat. I asked Peg to act like she was pulling The African Queen through shallow, leech-infested sloughs. Even though she looks like she is grumbling or straining, we laughed as soon as I took the photo. Down and across the street the Pirate's Cove has a cannon and a life-sized fiberglass pirate inside for posing with. We've done that before, so we moved on to swampier pastures. We thought if we imitated Humphrey Bogart and Katherine Hepburn we would maintain our classy persona. Maybe it worked, maybe it didn't. 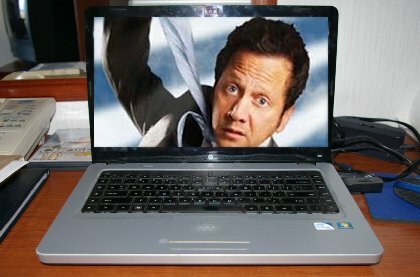 My younger sister gave me a Rob Schneider DVD, The Chosen One for Christmas. I dislike Schneider, but the DVD made the trip to Ocean Shores. 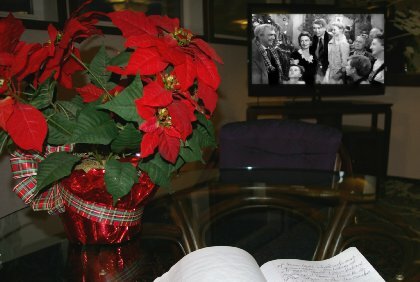 There wasn't a DVD player in the suite, but I had my laptop with me, so I turned it on and watched the film. What a surprise. I enjoyed the movie! I laughed and laughed. Peg joined me at the desk and we watched it all. It was tightly scripted, well directed and nicely acted. I checked out other reviews of the film. One person complained that the DVD said it was a comedy, but they had never laughed, "Not even once." But, they liked the movie. I recommend the DVD and both Peg and I laughed and enjoyed it. Maybe it connected with my sense of humor. In the beginning Schneider's inebriated character is trying to hang himself with a four-in-hand knot, which I thought was probably a good idea. I hate neckties. One of the very few places Peg and I had never eaten was the Fish Shack. Not every place in town is open in the winter and Christmas week is even harder on different businesses. Although we tried twice to visit the Ocean Shores Bakery (never open), we only tried once with the Fish Shack. There were only two tables occupied when we arrived. A third was in use (in the bar) when we left. We had the crab cakes and the fish and chips. 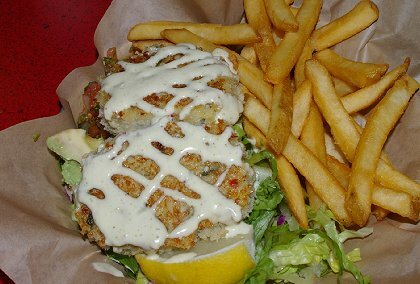 The crab was delicious and the fried fish was crunchy and went well with the tartar sauce and lots of lemon wedges. That's a winning combination. Peg washed her food down with a beer, while I chose lemonade. The interior is a little strange. There was an elaborate chandelier over a booth in the front of the restaurant. I don't know if it was for special people, or if it was just for formal dining. The food was good enough to require a second visit, but the restaurant was out of oysters, which are one of our favorite seafoods. 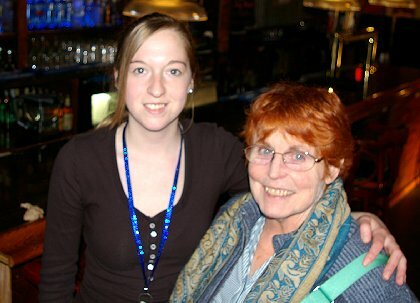 Our server, Briel, told us when the oyster shipment would arrive, but the time didn't fit with our schedule . . . I think the only drawback for visiting Ocean Shores during Christmas week was the fact that several food items at different restaurants were not in stock. Seafood is expensive, even if you are right beside the sea, so you don't want it to go to waste. We managed without ordering some selections, but it's just something of which to be aware. One of our family Christmas traditions has been bacon sandwiches after midnight Mass on Christmas Eve. Peg's dad always had them ready when they returned. The family gave up midnight Mass some time ago, but bacon sandwiches hav continued. I thought about cooking bacon in the microwave, but came up with a better idea. We circled back to the Pirate's Cove. I parked outside and went inside to ask about BLTs. They make them, so I ordered two to go. We didn't wait until midnight, but later that evening we broke out the cider and ate the bacon sandwiches. 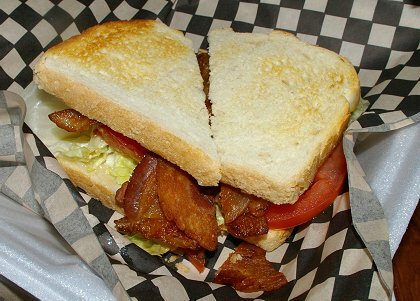 The Pirate's Cove has always had tasty sausage links and bacon, so I knew the BLT would be good. What I didn't know was the amount of bacon they loaded onto the sandwich. I'll have to order those "to go" for a picnic on the beach the next time we are in town. That would be fun. There is a souvenir store on the main road a few hundred yards from the Shilo Inn. 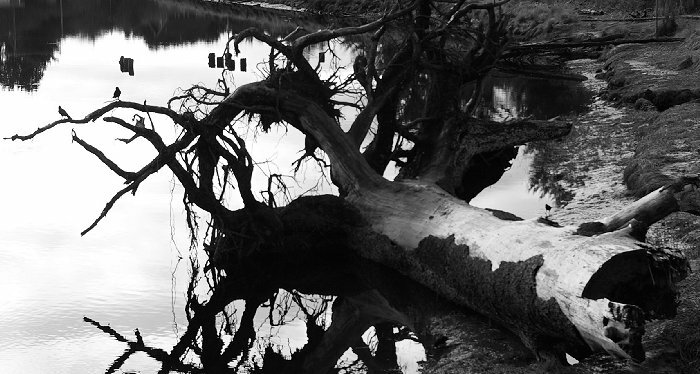 We've passed it a number of times over the years and I've often thought we should be taking photographs there. You have to walk through a giant shark's mouth to enter the store. Fun stuff. Earlier this year we saw the shop in an independent feature film, Safety Not Guaranteed starring Mark Duplass. The film is about a classified ad whose writer is seeking a volunteer for time travel . . . you must supply your own guns and your safety is not guaranteed. 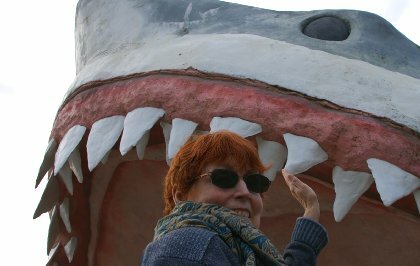 Many of the scenes were shot in and around Ocean Shores, including the shark's mouth shop. Funny film and nice location shots. There were maybe four locations available for Christmas dinner in Ocean Shores. 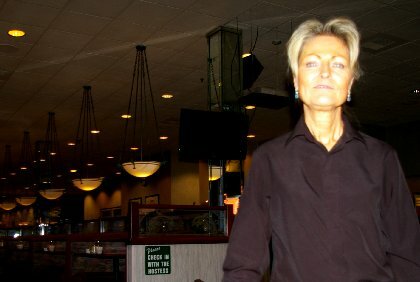 We've eaten at one of the places and it was only okay, the second was Galway Bay, an Irish eatery and pub, which generally features Irish music, the third was the smokey local Quinault Casino, and the fourth was the restaurant at the Shilo Inn. We had enjoyed both the service and the food at the Shilo . . . and we could crawl to the elevator if we had to, so the choice was an easy one. We made reservations for four in the afternoon. My prime rib was medium rare just as I like it. 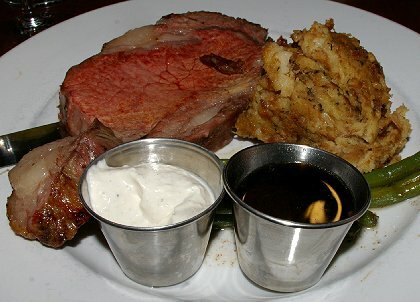 The flavor was spot on and I loved the horseradish sauce (not too spicy) and the au jus. I turned down the mashed potatoes and selected the stuffing/dressing instead, which I augmented with the au jus as Peg suggested. She had the salmon, which was a little disappointing. I think what made it disappointing was the fact that the steelhead the first night was so wonderful. We both could have devoured more of the really good green beans! By dining at four in the afternoon, we were able to bask in the glow of the setting sun. Everything was golden. 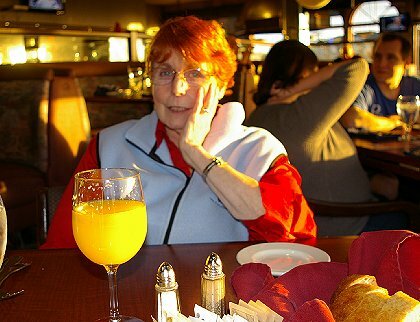 Peg and I had unlimited Mimosas for only $4.50 each. Unlimited for us was one per person. We chose a table by the window. I faced Peg and she faced me at an angle that didn't include looking directly into the sun. The people sitting in booths, however had to keep asking for the shades to be drawn although, there were two and three cell phone cameras at each booth taking photographs of the sunset. I, of course, couldn't take my eyes off Peggy. She was all aglow. We chatted and laughed and talked about the sights we had seen and enjoyed. 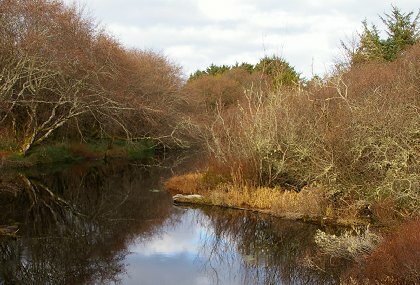 One of the joys about visiting Ocean Shores is the canals, creeks, rivers, inlets, and backwaters that surround the area. We thought about visiting Grayland and the estuaries on the other side of Gray's Harbor, but we didn't want to drive back through Hoquiam. We decided instead to drive north. There are small communities (Ocean City, Copalis and Moclips) that offer interesting views. 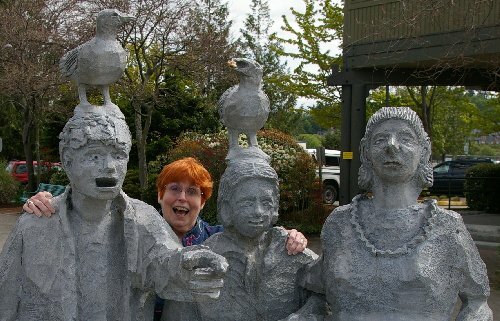 We also drove to the Quinault Casino/resort and Ocean City Park. Every time you spot a bridge you have the opportunity to see moving water and ponds as well. The stark beauty of the winter contrasts well with the dark green beauty of the spring and summer. All you have to do is just drive and look around. By the time our Christmas week began Peg and I had shared almost all of our presents. Many of them were books. Peg bought me a book about Red Cloud, which I proposed to my book group. We'll be discussing "The Heart of Everything That Is: The Untold Story of Red Cloud, An American Legend" at our January meeting. She also bought me the new Beatles coffee table book, "All The Songs The Story Behind Every Beatles Release." I read part of both of them during the week. I bought Peg a review copy of "My Venice and Other Essays" by Donna Leon. The book is just coming out at the end of December. We've been reading Leon's mysteries this last year. Her main character is Commissario Guido Brunetti of Venice. There is a English-subtitled German TV crime series featuring Brunetti. We enjoyed Venice several years ago when we traveled there with friends. The hardbound books come with maps of Venice. 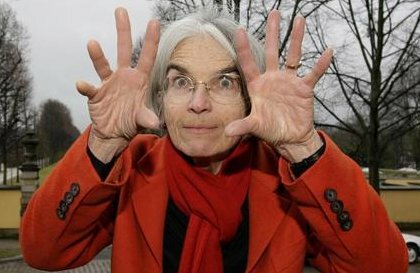 Donna Leon is an American author who left Iran in the 70s and then found herself in Italy. Her essays are sometimes quite funny and they shed light on many of the elements we love about her Brunetti series. Peg read the essays to me as we drove back to Tacoma. The day after Christmas I went down for breakfast and chose to sit by the fire pit rather than an individual table. Soon after I began my breakfast an interesting couple, Phyllis and Dann, were seated at the fire pit, also. They are from Norman, Oklahoma. I overheard them say they were from Oklahoma, so I mentioned I was born in "Missourah." Phyllis, said, "Oh, you pronounced it right." She meant instead of "Missouree." I told her my mom was born in Chickasha, which is only about forty miles from Norman. Phyllis had dreadlocks and Dann had a pony tail, so I thought they were a perfect fit for the Northwest. Indeed they are. She and Dann were visiting Dann's brother Andrew and the three of them along with Dann and Andrew's mother chose to spend Christmas in Ocean Shores. The four of them were leaving that afternoon returning to Port Angeles. 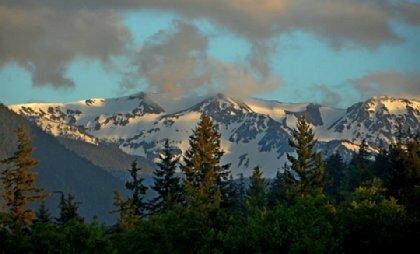 Phyllis and Dann purchased acreage near P.A. and hope to retire there when they leave Oklahoma. We talked, and talked, and talked. When Andrew and his mom joined us I figured I should return to my room and see how Peg was doing. Back in our room, Peg was up and ready for breakfast. I told her to sit by the fire pit and meet my new friends. She did . . . and they talked, and talked, and talked. Peg returned over an hour later. The fire pit is a lot like the dining table at a Bed & Breakfast. If you sit there you'll probably meet others who are visiting the area, and generally they are people with open personalities who are willing to laugh and chat. For a late afternoon lunch we visited the newly remodeled Galway Bay. Last time there I bought two Irish tweed hats. One was a Donegal flat cap and the other a Donegal Walking Hat. This time Peg bought a present for a friend and then we had lunch. We each had a glass of Irish beer. I ordered the oyster dinner, while Peg had the oyster appetizer. I was shocked when I saw that she had seven fried oysters to my six, but since I knew I would get some from her plate, I wasn't too upset. Before when we've eaten there I've always ordered Irish stew, a sausage roll, lamb pie or other traditional Irish food. I never thought to try the oysters at Galway Bay. Big mistake. After all, Ireland is an island where they sell mussles and cockels "alive, alive o," so oysters were not that unusual. 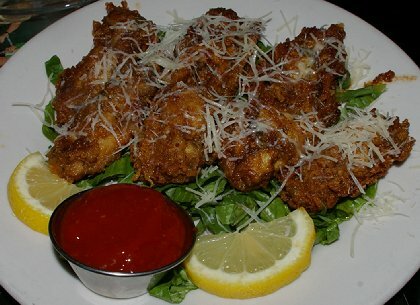 They were perhaps one of the best servings of oysters we've ever had here in Washington . . . or anywhere for that matter. On Friday we were a little reluctant to leave the Shilo. We went down to the restaurant for our last breakfast. As we talked about our stay the couple behind us in a booth offered up their drink tickets. I think it was a father and daughter. They were from Yelm, just outside of Tacoma. He used to work for the Nisqually News. My cousin Tyler as recently as six months ago worked for that newspaper, while he attended St. Martin's. We only talked briefly, but it was a nice connection. We'll miss the excellent food at the Shilo Inn restaurant at Ocean Shores as well as the people who work there AND the new people we met. We packed our bags and took one last walk around the lobby. We never made it to the pool or the exercise room, but we enjoyed the sailing ship models, the Dickens Christmas display, and the bronze statues of dolphins and mermaids. I think we'll probably return before next Christmas, but I would put Christmas week high on my "to do" list for the end of 2014. Maybe we'll try to stay for both Christmas and New Years. I think that would be fun. Perhaps, in a senior suite next time! Ocean Shores Christmas Adventure, shilo inn Ocean Shores, galway inn Ocean Shores, pirates cove Ocean Shores, fish shack Ocean Shores, construction debris removal recycling ocean shores, Ocean Shores Christmas Adventure Ocean Shores Washington WA.